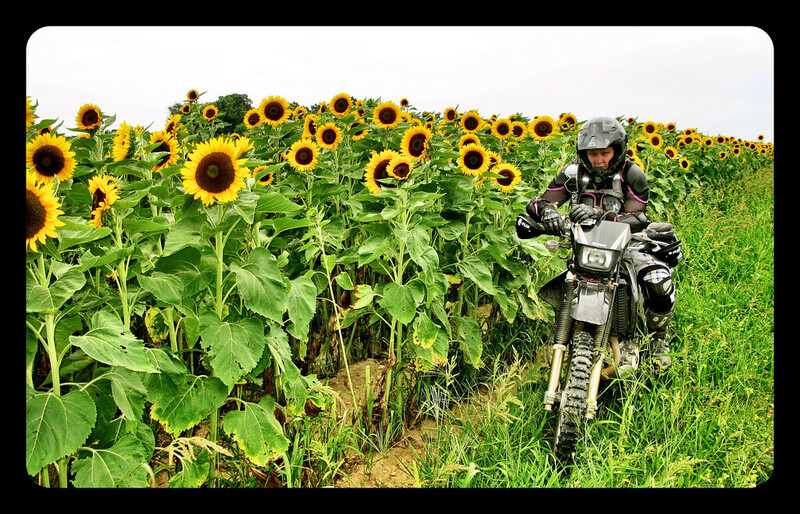 While out for a ride with Kenny and Ben, I spotted a crop of sunflowers. With their happy disposition, they’re one of my favorite flowers. Even though I’m generally pretty camera shy, I just HAD to have Kenny take my picture with them. You crack me up. Yes, the sunflowers are sweet. What’s so funny? I would have thought you’d be smiling broadly to match the sunny disposition of the sunflowers. You just look so serious. I’m sure you were smiling on the inside, though. It was so flippin’ hot out there, my smile may have melted off at that point. I love this! I mean, I really love this. The picture is everything I look for in a photo — whimsy, visual beauty and the presence of a dear friend. You are funny, why are you camera shy? I have no problem planting myself in my pictures. I love it! So cheerful! That pic came out great, good eye! You seem to keep finding stuff for a pic every time we head over there. That is a very good tip, P. Are you speaking from experience?